Hello art and beauty lovers! So, we were walking around downtown in Charleston this past Sunday, just enjoying the day, the scenes, (the dessert! ), the waterfront views, and the beautiful homes… While on our lazy-day walk, I was literally stopped dead in my tracks by the artwork in the window of the Ella Walton Richardson gallery. You can clearly see why, I’m sure… Unfortunately, the gallery was closed as it was Sunday afternoon, so I snapped a couple of photos to share with you. Jeff Jamison is a masterful painter who believes that the only thing standing between himself and a masterpiece is his own hands, and, in my opinion, he errs on the side of “masterpiece” crazy often! I love the painterly brush strokes and the expert smooth blending, combined with the stark shapes and textured areas. Jeff paints snapshots of everyday life, full of energy, motion, and shapes and colors. And let me tell you, these pieces are inedible in person. I love these painting because they inspires me. 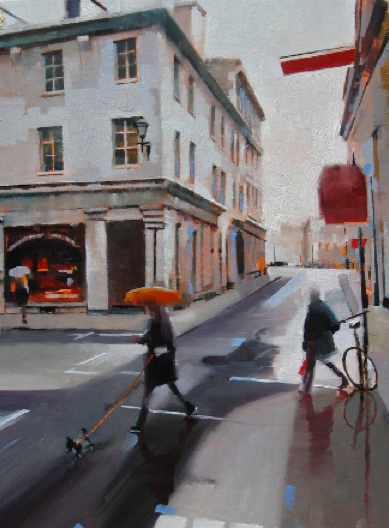 I love segmenting shades and shapes within a scene and Jeff Jamison does that so, so well. Love it, don’t you? His street scenes remind me of Caillebotte’s Paris Street, Rainy Day. They are lovely. I love his work too! I saw his paintings the last time I was in Charleston visiting my sister. Gorgeous color and well balanced! These are beautiful, they look like something you would hang in a French chateau, in an old French film. I love how some parts are almost black and white, and in others there are splashes of color. These are amazing, the wet light ! your time for this fantastic read!! I definitely appreciated every little bit of it and i also have you book-marked to check out new information in your website.